Any HTML page can be enhanced with interactive forms that prompt visitors to fill in information: enter text, select options, confirm with a button... anything is possible! However, we are reaching the limits of the HTML language as you then have to analyze the information that the visitor has entered... and this can't be done in HTML. As we're going to see, the results have to be processed in another language, such as PHP, for example. In the meantime, we have a large number of new HTML tags to discover. Welcome to the wonderful world of forms. A world where buttons, checkboxes and drop-down lists coexist harmoniously (well almost). When you have the sudden urge to insert a form in your HTML page, you need to start by writing a<form> </form>tag. This is the form's main tag and it specifies its start and end. Note that you have to enter block tags (as<p> </p>) inside your form if you want to include text in it. So much for basic structure. Now, pay attention: what I'm going to tell you isn't easy as we've reached the limits of HTML. Let's take an example to make things clear. Suppose your visitor has just entered a comment in your form, such as, for example, a message that they'd like to publish in your forums. This message has to be sent so that you can receive it (logical, right?) and display it to your other visitors. Problem No 1: how do you submit the text entered by the visitor? By what means? Problem No 2: once the data have been sent, how do you process them? do you want to receive the message automatically by e-mail or would you prefer a program to save it somewhere, and then display it in a page that everyone can see? method="get": this is a method that is generally not well suited as it's limited to 255 characters. The particularity comes from the fact that the information will be sent to the page address (http://…), although this detail doesn't really matter for the time being. I recommend you use the other method most of the time:post. method="post": it's the most widely used method for forms as it allows a lot of information to be sent. The data entered in the form don't go through the address bar. action: is the address of the page or program that is going to process the information (solution to problem No 2). This page will send you an e-mail with the message if this is what you want, or else save the message with all other messages in a database. This can't be done in HTML and CSS so we generally use another language that you may have heard about: PHP. So we're now going to complete the<form>tag with two attributes that we've just seen. Formethod, you've guessed it, I'm going to enter the valuepost. Foraction, I'm going to enter the name of a fictitious page in PHP (traitement.php). This is the page that will be called when the visitor clicks on the submit button in the form. For the time being, we don't know what happens inside the pagetarget.php: let's take my word for it and assume that this page is up and running. Our priority, for the time being, is to find out in HTML/CSS how to insert text fields, buttons and checkboxes in our web page. And this is what we're going to see now. So, let's get back to something tangible. We're going to review the various HTML tags needed to enter text in a form. The single-line text field: as its name suggests, you can only enter a single line into it. It's used to enter short texts, such as a user name. The multi-line text field: this text field allows you to enter a large amount of text on several lines, for example, a dissertation on the use of HTML in the development of countries of South-East Asia (just a suggestion, eh... ). The figure below shows what a single-line text field looks like. To insert a text field in a line, we're going to use the tag<input />. We'll come across this tag several times later in this chapter. In each case, it's the value of thetypethat will change. This is still not enough: you have to give your text field a name. Although this name doesn't appear on the page, you'll need it later. Indeed, it'll tell you (in PHP, for instance) where the information comes from: you'll know that such and such a text is the visitor's user name, such and such a text is the password they've chosen, etc. As usual, I strongly suggest you try this code yourself to see the result. This code gives the exact same result that you saw in the previous figure. But this is not enough. You have to link the label to the text field. To do this, you have to give the text field a name, not using thenameattribute but with theidattribute (that can be used with all tags). Anameand anidin the field? Won't that be redundant? Yes, somewhat. Personally, I givenameandidthe same value, this is not a problem. Try clicking on the "Your user name" text: you'll see that the cursor is automatically placed in the corresponding text field. You can increase the size of the field usingsize. You can limit the number of characters that can be entered usingmaxlength. You can pre-populate the field with a default value usingvalue. You can give some indication of the field's contents usingplaceholder. This indication will disappear as soon as the visitor has clicked inside the field. Test the result yourself to see how the field behaves. In the meantime, the figure below shows how the field looks in its initial state. You can easily make the text field behave like a "password field", in other words, a field where you don't see on the screen the characters entered. To create this type of entry field, use the attributetype="password". You'll see that the password characters aren't displayed on the screen, as shown in the figure below. To create a multi-line text field, you change the tag: we're going to use<textarea> </textarea>. Like any other form item, you have to give it a name usingnameand use alabelthat explains what it is. And here's the result as an image (figure below)! As you can see, it's a bit small! Fortunately, you can change the size of<textarea>in two different ways. In CSS: just apply the CSS propertieswidthandheightto<textarea>. With attributes: you can add the attributesrowsandcolsto the tag<textarea>. The first one specifies the number of lines of text that can be displayed simultaneously, and the second one the number of columns. Why do you open the<textarea>tag and then close it again immediately afterwards? You can pre-populate<textarea>with a default value. In this case, we don't use the attributevalue: we simply enter the default text between the opening tag and the closing tag! How do you think I can improve my website? Come now! It's so great it won't need any improving! And here's the result in the figure below. HTML5 provides many new features related to forms. Indeed, new field types emerged with this version. Just give thetypeattribute of the<input />tag one of the new available ​​values. Let's do a quick overview! All browsers don't yet recognize these enhanced entry fields. In their place, older browsers will display a simple single-line text field (as if you'd enteredtype="text"). Between you and me, this is just fine: new browsers can enjoy the latest features, while older browsers display a replacement text field that fits just as well. So you're advised to use these new entry fields from now on! At best, your visitors will benefit from the new features and, at worst, they won't see any problem. The field will normally seem the same to you, but your browser now knows that the user has to enter an email address. It can display an indication if the address is not an email, which is what Firefox does, for example (figure below). 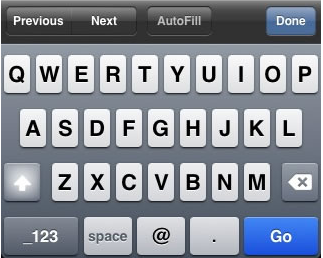 Note that some browsers, such iPhone and Android mobile browsers for example, display a keyboard suitable for entering email addresses (below). Same principle: if the field doesn't seem different on your computer, be aware that it has effectively understood that the visitor is supposed to enter an address. 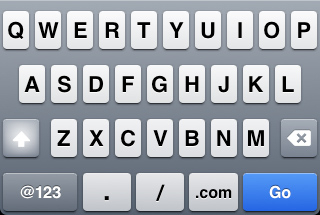 For example, mobile browsers display a keyboard suitable for entering URLs (figure below). 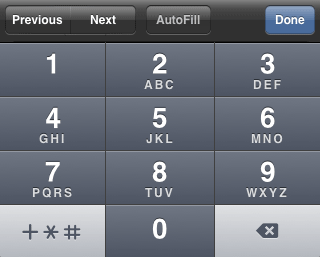 On the iPhone, for example, a suitable keyboard is displayed when the visitor has to fill in the field (figure below). The field is usually displayed with small arrows to change the value (figure below). step: this is the movement "step". If you specify a step of 2, the field will only accept 2 by 2 values (for example, 0, 2, 4, 6, etc.). You can use themin,maxandstepattributes again to restrict the available values. In practice, it is not used all that much by browsers at the present time. Don't be surprised if you only see an ordinary text field. datetime-localfor the date and time (no time zone management). As you can see, there's a wide choice! At present, few browsers support this type of field except for Opera. The browser then decides how to display the search field. It can thus add a small magnifying glass meaning that it's a search field and to possibly store the last searches performed by the visitor. Add a<label>in the right position, and there you are! Don't forget to give a different name to each checkbox. Later on, this will allow you to identify the ones checked by the visitor. All attributes normally have a value. In this case, however, adding a value is not required: the presence of the attribute is enough to make the computer understand that the box has to be checked. If this bothers you, remember that you can assign any value to the attribute (some webmasters sometimes writechecked="checked"but it's a bit redundant!). The box will be checked irrespectively. The options fields allow you to choose one (and only one) option from a list of possibilities. They look somewhat like checkboxes but there is a slight additional difficulty: they have to be organized as groups. Although the options in the same group have the same (name), each option has to have a different (value). The tag to be used is always a<input />, this time with the valueradiofor the attributetype. Which gives result shown in the next figure. Why did you put the same name for each option? Just so that the browser knows which "group" the button belongs to. Try removing thenameattributes and you'll see that you can then select all the options. However, this is not what we want, which is why we "link" them together by giving them the same name. You'll notice that this time we've chosen aniddifferent fromname. Indeed, as the values fornameare the same, we couldn't have differentiated the ids (and you know full well that anidhas to be unique!). That's why we've chosen to give theidthe same value asvalue. Thecheckedattribute is again available for selecting a default value. Drop-down lists are another elegant way of selecting an option from several possibilities. They work in a slightly different way. We going to use the<select> </select>tag which specifies the start and end of the drop-down list. We add thenameattribute to the tag to give a name to the list. Then, inside the<select> </select>tag, we're going to insert several<option> </option>tags (one for each possible choice). We add avalueattribute to each of them to identify what the visitor has chosen. The result obtained is shown in the figure below. You can also group your options using the tag<optgroup> </optgroup>. 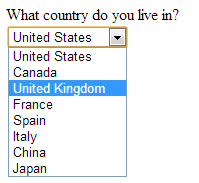 In our example, why don't you separate country according to their continent? Groups cannot be selected. 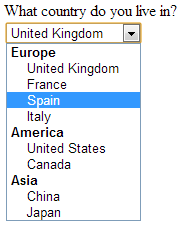 So we can't choose "Europe" in our example: only country names can be selected. We're almost there. 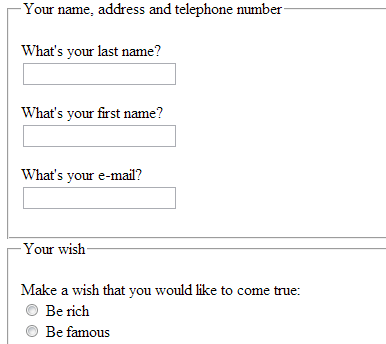 It only remains for us to decorate our form with few final features (such as confirmation) and then add the form submit button. You can automatically place the cursor in one of the fields in your form using the attributeautofocus. Once the visitor loads the page, the cursor appears in this field. You can make a field mandatory by assigning it the attributerequired. The browser will then tell the visitor, if the field is empty when the form is submitted, that they are required to fill it in. CSS provides pseudo-formats for changing the style of items that are (:required) and (:invalid). Don't forget either that you have the pseudo-format:focusto change the appearance of a control when the cursor is within. type="image": equivalent of thesubmitbutton, displayed this time as an image. Add thesrcattribute to specify the image URL. You can change the text displayed inside buttons using the attributevalue. When you click the "Submit" button, the form then takes you to the page specified in the attributeaction. Remember, we imagined a fictitious page:target.php. The problem is that you can't create this page in HTML only. You have to learn a new language, such as PHP, to be able to "retrieve" the entered information and decide what to do with it. As it happens, I'm also writing a course on the PHP language for those who might be interested! This course will be published soon. Some websites provide services called "Mailform" which send you an e-mail when one of your visitors has filled in the form. Although this eliminates the need to learn a new language, it's not very convenient: you have to either pay, or put up with advertising... and you don't have many possibilities for customizing data processing. A form is an interactive area in the page, where your visitors can enter information. A form is circumscribed using the<form>tag to which two attributes have to be added:method(data submitting method) andaction(page to which the visitor is redirected after submitting the form and which processes the information). The<label>tag is used to enter a label. It is associated with a form field using theforattribute, which must have the same value as the form fieldid. 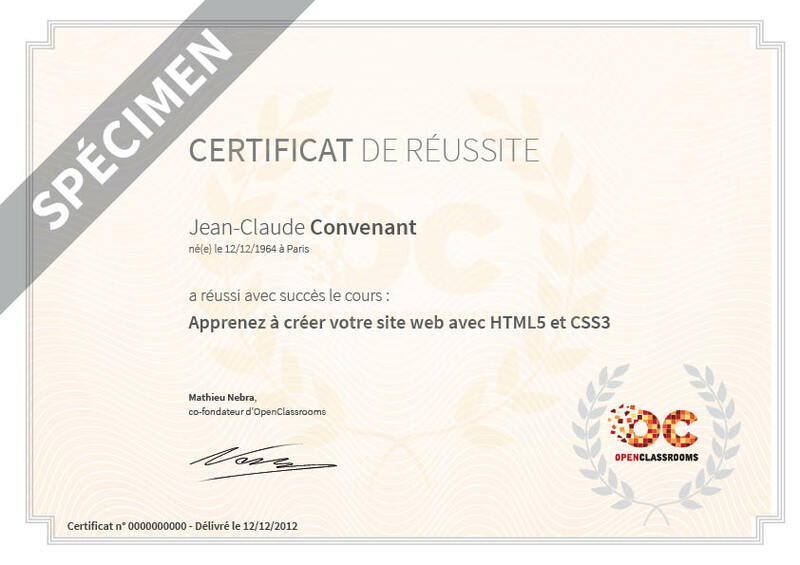 To retrieve what visitors have entered, the HTML language is not sufficient. You have to use a "server" language such as PHP... If you want to go further, you're going to have to learn a new language!